Recently, I watched part of a video series with food photographer Penny de los Santos. It was fascinating to watch a pro at work, and the thing I remember most was her advice to stay with the subject. Change your point of view, change your settings and just keep trying something new. 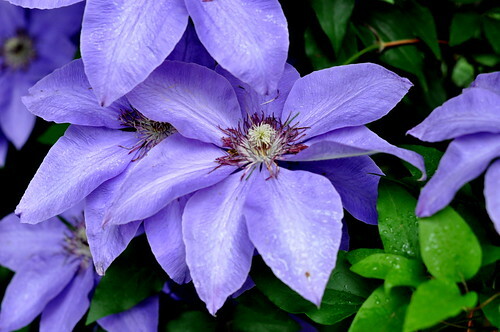 So even though I’m an amateur, I’ll share the process that I used on a beautiful clematis I saw one morning last month. 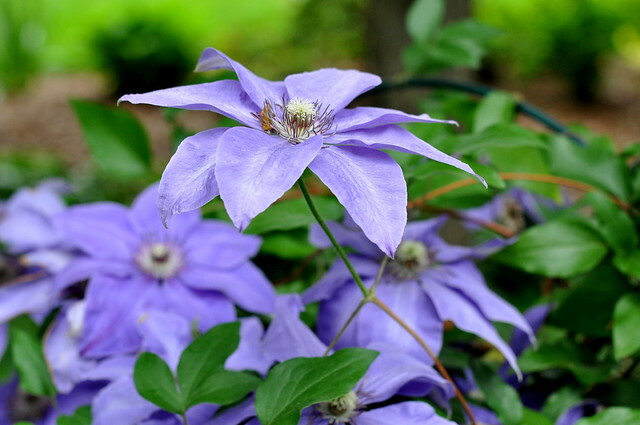 It’s a little battered after the rain, but still lovely…. I took this in the morning when there was nice light and the plant was mostly in light shade. As I’ve said before, bright sunlight washes out colors and you’re basically taking a picture of glare. Don’t feel bad if you’ve been doing this–I did it for years! I always take vertical and horizontal shots. As Penny pointed out, most magazines and books have a vertical layout, so keep that in mind if you want to be published. I think portraits are always better shot vertically. Unless there’s a stunning background, but then what’s the real subject? Vertical orientation of the same shot. This one is too battered to put on my main Flickr page, plus the highlights are blown out a little. I should have changed the aperture or shutter speed or both. I’m using this to show how you can get in closer and get a more dramatic shot. And mistakes that can and do happen. Less battered and the main subject is more shaded. Another vertical shot. This time I noticed the beautiful green in the background and moved around until I had it in the right place. 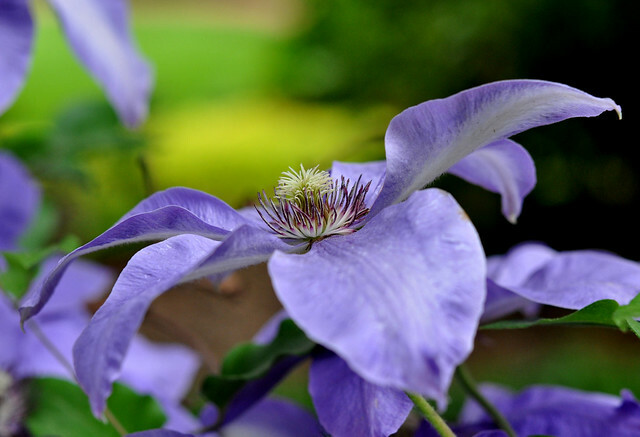 This entry was posted in photography and tagged blueviolet clematis, macro, Penny de los Santos. Bookmark the permalink. 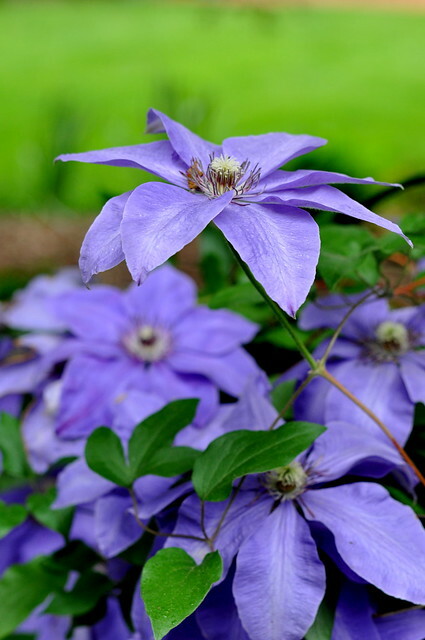 Love the colors together, I never thought of how well purple and green compliment one another! Beautiful! I became a fan of those colors when I got some purple tulips. Nature does it so well! Pretty. 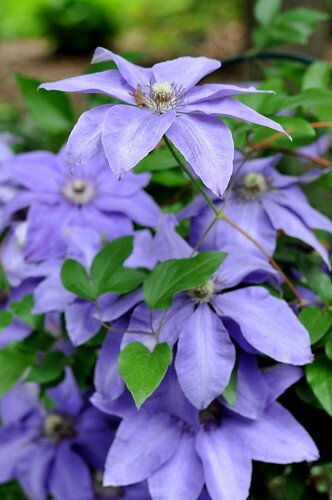 Our clematis is really unhappy. Maybe it’s not meant to cover a bright sunny wall but would be happier in the shade. 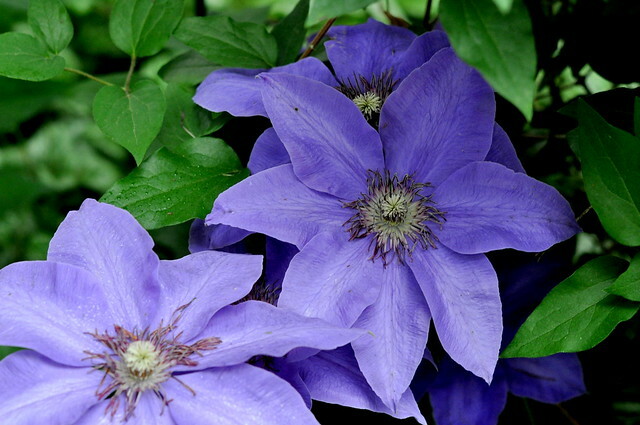 Jennie, I wish I could say this is my clematis, but it’s not. I’ve planted my third one this year and hope it survives. The other two were over-fertilized and under-watered. Supposedly, the trick is to shade the roots and give the flowers sun. I know someone who used a big rock and that worked. Hopefully the third time’s the charm. Great color combination. I once said to someone that I like the light when it rains or just after because it brings out the colors much more than sunlight. The person did not understand what I meant. You just confirmed it. I never paid attention whether the shots are vertical or horizontal. I think I have no preference. Yes, rain really crystalizes everything. In California, things look slightly out of focus before it rains and then everything is clear and sharp. The effect is not so dramatic on the East Coast, probably because of the humidity. Were you in Kiefer’s back yard? I swear he has the same flower! No, I promise I’m not stalking your boyfriend. 🙂 Does he have a green thumb?? They are all lovely exposures, Carole – lavender is such a soothing colour. I’m pretty much a fan of the vertical shot. That said, the ‘pristine’ blossom taken from the horizontal view is absolutely stunning. I love early morning or early evening light, and recently got this shot http://jpgmag.com/photos/3020401 dodging thunderbolts mid-day. I couldn’t resist the electrified green. Oh, you still have that spring green! Ours is slowly going away–so hot the past two days. Lovely today though.